For my birthday I received a box of semi-boneless quail from Broken Arrow Ranch. We had some guests over so I decided to make something up using food we had on hand. They turned out way better than I expected. I made a two pound batch of sausage which was enough for 12 quail. I only cooked 8, so I froze the rest of the sausage for next time. I’d estimate about 3oz of sausage per quail. Season the quail with salt and pepper. Mix all the remaining ingredients in a bowl until well mixed. Stuff each quail with as much sausage stuffing as it will hold. Heat your oven to 375°, and heat a large dutch oven with a good amount of butter. Add the quail to the dutch oven, browning the breasts for about 5 minutes. 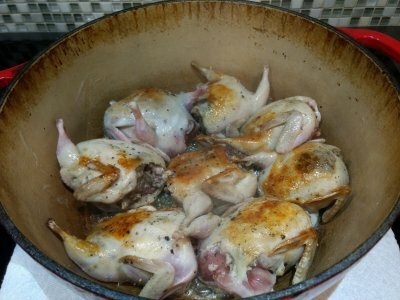 Flip the quail, then move the dutch oven to the oven (without the lid). Bake for 15-20 minutes, until the sausage is fully cooked.